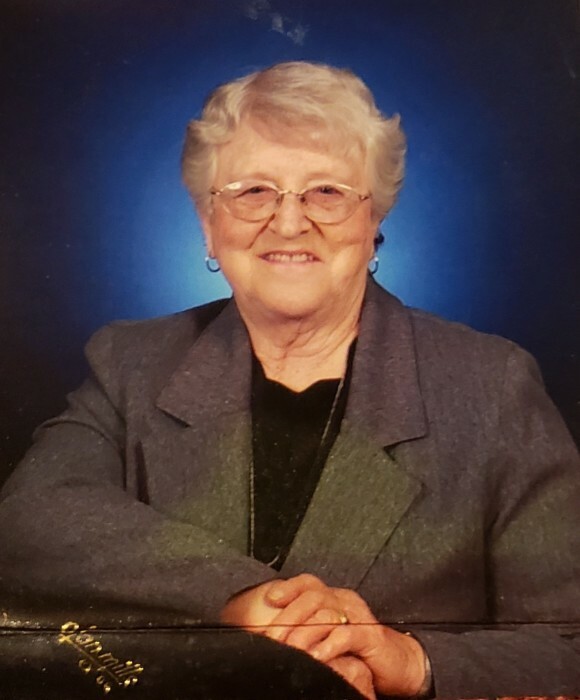 Marian B. Owen, 86, of Bunker Hill, IL died at Rosewood Care Center, Alton, IL on Friday, February 8, 2019 at 7:34 am. She was born July 5, 1932, in Bunker Hill, IL to Willis C. Wolff, Sr. & Lena (Schreiber) Wolff. She married Frederick "Fred" Owen in 1949 in Muddy, IL. She was a homemaker and a retired school bus driver for Bunker Hill School District for 20 years. Marian was a member of the Berean Baptist Church and Red Hat Ladies. She enjoyed traveling, camping, and spending time in Mission, TX for the winter. Marian also enjoyed her grandchildren . She is survived by her three children, Linda (Jim) Maness of Bethalto, IL, Mickey (Patricia) Owen of Saint Louis, MO, Roger (Theresa) Owen of Bunker Hill; grandchildren, Dawn Sterling of WA, Shawn Maness of Cottage Hills, IL, Ryan Kirk of Bunker Hill, IL, Tara Caul of Saint Louis, MO, John Owen of Saint Louis, MO, Hannah Owen of Saint Louis, MO, Trishia Heflin of Dorchester, IL, Tiffani Owen of Bethalto, IL, Tabitha Owen of Bunker Hill, IL; great-grandchildren, Keegan Throne, Chase Sterling, Reghan Sterling, Paisley Sterling, Spencer Kirk, Cash Kirk, Clayton "CJ" Maness, Cooper Phillip Heflin and sister, Dorothy Goebel of Prairietown, IL. Marian was preceded in death by her parents, spouse, brother and sister in law, Willis Wolff, Jr. and June Wolff and brother in law, Norman Goebel. Friends may call on Monday, February 11, 2019 at Kravanya Funeral Home in Bunker Hill from 5:00 pm until 8:00 pm. Funeral services are Tuesday, February 12, 2019 at 11:00 AM at Kravanya Funeral Home in Bunker Hill, IL with Rev. Jeff Warix officiating. Burial will be at Bunker Hill Cemetery in Bunker Hill, IL. Memorials are suggested to Shriners' Hospital. Anyone wishing to send an online condolence may do so at www.kravanyafuneral.com. Kravanya Funeral Home, Bunker Hill, IL is in charge of the arrangements.